4. Best Sellers: includes Mother’s Day Cards, The Complete Songs of Robert Tannahill. Have you seen these related items? The Vital Spark DVD: Sadly, these are the only five remaining episodes of this classic BBC series. This DVD is a real treat for fans of Scottish humour! Para Handy (book) Neil Munro’s Para Handy has been sailing his way into the affections of generations of Scots since he first weighed anchor in the pages of the Glasgow Evening News nearly a hundred years ago. This definitive edition contains all three collections published in the author’s lifetime, as well as a new story never previously published which was discovered in 2001. Extensive notes accompany each story, providing fascinating insights into colloquialisms, place-names and historical events. This volume also includes a wealth of contemporary photographs, depicting the harbours, steamers and puffers from the age of the Vital Spark. Monday 8th of March was International Women’s Day. It’s a global day celebrating the economic, political and social achievements of women past, present and future. The first IWD was run on the 19th March, 1911. More than one million women and men attended IWD rallies campaigning for women’s rights to work, vote, be trained, to hold public office and end discrimination. Scotland’s music carries on this tradition. Here’s some amazing women within Scottish music. Karine’s debut solo album Faultlines won many awards when it came out. She’s one of our best song writers and is not scared to write (and sing) about difficult issues. Have a listen to her song The Sun’s Comin’ Over The Hill – it’s a corker! Singer, piper, storyteller, teacher and all-round tradition bearer, Rona Lightfoot is one of Gaeldom’s great characters, a one-woman ceilidh with a treasure trove of folklore and the spirit to take on authority and win. Many of the piping competitions were for men only and Rona campaigned against this, proving her point by becoming the first woman to take part in the coveted Bratach Gorm (or Blue Banner), the Scottish Piping Society of London’s premier pibroch competition (although sh was only allowed to enter once!). Sheena is one of Scottish traditional music’s most passionate advocates, an internationally recognised champion of Robert Burns and in her proudest achievement, the singer who will forever be remembered for her stirring singing of A Man’s a Man for a’ That at the Scottish Parliament’s opening in 1999. As a tireless campaigner for traditional music from school room to concert hall, she was traditional music’s first representative on the Scottish Arts Council’s music committee, and became Scotland’s first traditional arts development officer, spending five years in her adopted home of Fife encouraging artists in all disciplines to feel valued and to pass on their skills. It is generally agreed by folklorists that the Scottish travelling folk are among our finest oral tradition bearers, be it song or tale. Many of these tinker families claim direct descent from the dispossessed and scattered clans who supported the losing side at the battle of Culloden in 1746. Belle was of travelling stock; proud, dignified and a distinguished maintainer of noble traditions. A singer, songwriter and poet, Belle was born on 18th July 1906, in a ‘wee bow-tent’ by the side of the River Tay at Caputh. Stewart’s amazing ability to recall songs from the past meant she was visited frequently by folksong collectors, musicians, and musicologists. Featuring award winning singer Julie Fowlis, this all-girl band have taken Gaelic, Scots, Shetlandic and Irish music to the masses. They have a very distinctive sound that is loved wherever they play. In 1816 Captain Simon Fraser of Knockie in the Scottish Highlands published a collection of 232 airs and melodies from the Highlands and Islands and left a legacy of Celtic music that has endured by its merit into the 21st century. Simon Fraser was taught violin by Nathaniel Gow and tried to present his music in the style of other successful Scots musicians of the day. Although some of his own work is included amongst the tunes the majority was derived from the singing of his father and grandfather. These were the songs of the bards of the Scottish Gaeldom, including songs of the Jacobite rebellions. Due to the political climate of the time Fraser was compelled to leave out the words in order to publish his work. The first edition of the book (published in Edinburgh) sold out but his schemes ended in ruin when he was persuaded to invest the proceeds in a venture to export thousands of volumes of his music to America and India. In America pirated copies of the music were already in circulation thus destroying his hopes and investment. In 1999, the first performance of the play “The Captain’s Collection” opened in Captain Fraser’s homeland in Errogie, on a memorable night when a thick, ghostly fog drifted down from the Monadhliath and almost two hundred people packed into tiny Stratherrick Hall. Following up with a more extensive tour in April 2000, the play was described in The Scotsman as “fascinating and provocative music theatre”. Captain Fraser’s Airs and Melodies Peculiar to the Highlands of Scotland and the Isles was originally suggested by Bruce MacGregor of the band Blazin Fiddles as the basis for a musical play as part of Highland Festival 1999. The play The Captain’s Collection was written by Hamish MacDonald and directed by Alison Peebles. It was developed into an award winning series for BBC Radio Scotland, produced by Bruce MacGregor. The Captain’s Collection CD featuring the musical repertoire of the play was produced by Jonny Hardie for the Greentrax label, and featuring Jonny Hardie – Fiddle; Brian MacAlpine – Keyboards; Alyth McCormack – Song ; Rory Campbell/Iain MacFarlane – Whistle & Pipes, becoming one of the most highly acclaimed and cherished CDs of Celtic music in 1999. Foot Stompin’ Mother’s Day cards in Scots and Gaelic: Not long now! With these original cards you’ll make your mother feel very special. Available in Scots and Gaelic. The high octane Scottish group Blazin’ Fiddles will raise the roof of the Old Fruitmarket in Glasgow this Sunday when they perform as part of Glasgow’s Concert Halls’ Fruitmarket Folk season. Join 2,000 pipers and drummers for the 12th Annual New York Tartan Day Parade – New York’s biggest celebration for pipers, drummers, Scottish music and single malt whisky – let the countdown begin! 2010 Grand Marshal will be Alex Fergusson, Presiding Officer of the Scottish Parliament. Great concert from the Gaelic Society of Inverness with the theme “Seasons and Moods”. It is happening 12th March at Eden Court Theatre.and will include Kathleen MacInnes;Arthur Cormack; Maggie MacDonald; Paul MacCallum; Canntaireachd; and the Monach Isles Ceilidh Band. Music in Hospitals, the organisation which brings performers into contact with people in various care situations, would like to include more traditional musicians on their roster. In particular they are looking for Gaelic singers. These gigs bring a lot of pleasure to people who cannot otherwise get out to hear music. 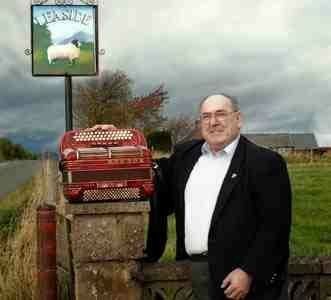 John Law a tireless campaigner and stalwart of the Scots Language Society has died very suddenly. He will be sorely missed. Another classic Foot Stompin’ ringtone from Back of the Moon and their Luminosity CD. Enjoy! Don’t forget to listen to our Free Scottish Music podcast featuring Outside Track, Brian McNeill, Iain Morrison, Duncan Chisholm, Catriona Garbutt and Phil Cunningham. Just reading that it’s 40 years since Jimi Hendrix died. Doesn’t seem that long ago! A lot has passed in that time in traditional music – any good memories? Just reading an article on a violin passed down through generations and still played. Does anyone here play instruments that have come through their family? Thanks so much for the free ringtones…I’m really enjoying them! Linda D.
Can I just record how pleased I am with your prompt service – received the DVDs this morning in the post – amazed. Will enjoy them tonight hopefully. Who were the first Scottish folk band?